The power of the consuming, purifying fire destroys the old and sweeps it away. Nothing is spared; the tower of the ego will be shaken to its very foundations. Anything you attempt to cling to will be destroyed by this transforming power. The apparent securities of the past have begun to waver and topple. All that remains is trust; the knowledge that all events in life arise from the endless love of the universe and bring us the possibility for learning and recognition. This understanding of the true nature of events transforms even apparent losses or painful disappointments into the valuable gifts they really are. Times of desperation and inner tension, when recognized, can become the most fruitful growing phases of our lives. 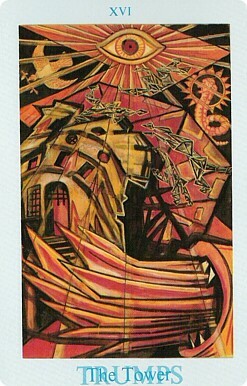 The Tower is also one of the highest cards for healing. Just as the extraction of a rotten tooth provides relief for the entire body, the destruction of stagnant situations and relations which hinder growth begins a healing process for your entire organism. Having a tooth extracted can be painful, but when the tooth is poisoning your system, there is no other choice. The strokes of fate may seem equally tragic and unfathomable, but they come to us only because we need them and have created them for ourselves either consciously or unconsciously. If you can recognize and accept these laws of the universe, you possess all you need for true liberation and total transformation to occur. The eye of Horus illustrates awakened consciousness, which sees reality as it truly is. The dove with the olive branch symbolizes the compassion toward oneself and others which arises out of self-knowledge. It also symbolizes that which remains pure and whole throughout; the essence of being, from which all is created anew (the snake). Lately, I’ve noticed this archetype come up quite a bit in my research for an entirely unrelated project, saving it for a later time to discuss. I think now is the time to do so. The Tower is an object that appears many times throughout the Bible, as well as in the western occult tradition. An obvious expression of this archetype can be seen in Genesis 11, when the citadel-like Tower of Babel is built by the “children of men”, in which the “LORD” (an intentional mistranslation because the translators did not want the Bible to show the difference between the Lord of the Old Testament (Jehovah) and the Lord of the New Testament, being the Lord Jesus Christ) or Yahweh/Jehovah and his minions investigates (inferring that Yahweh is not omniscient) and decides to confuse them. Yahweh said, “If as one people speaking the same language they have begun to do this, then nothing they plan to do will be impossible for them. Come, let us go down and confuse their language so they will not understand each other.” So Yahweh scattered them from there over all the earth, and they stopped building the city. 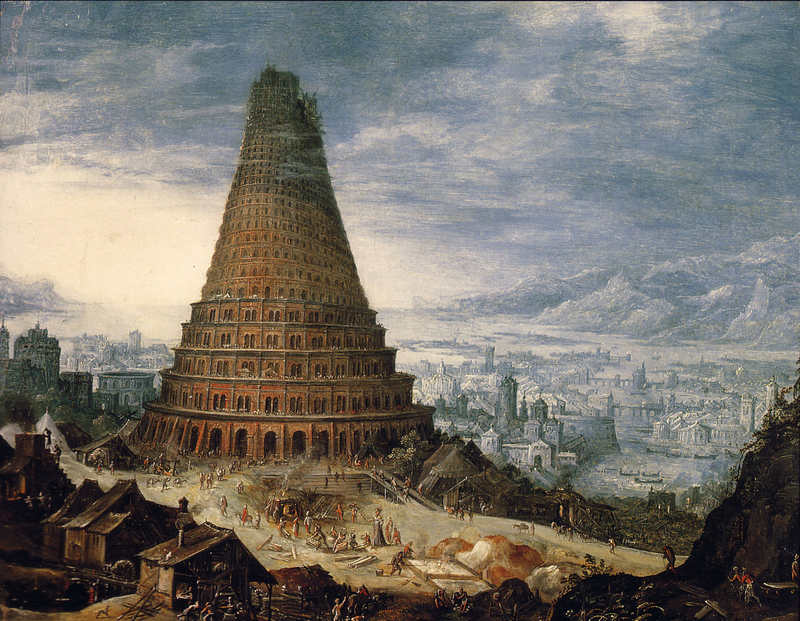 That is why it was called Babel –because there Yahweh confused the language of the whole world. From there Yahweh scattered them over the face of the whole earth. In Genesis 10:8-10, it tells us that the founder and builder of this Tower was Nimrod, who was the son of “Cush” and would eventually grow up to be a “mighty one on earth” and a “mighty hunter before Jehovah”. He also built the kingdoms of “Babylon, Uruk, Akkad and Kalneh, in Shinar.” In many ways, this effort to build this gigantic Tower mirrors Cain’s efforts to build a city named after his son, Enoch. Yes, that Enoch – the one the Book of Enoch is named after. In Part 4 of my Forbidden Fruit series, we saw how the Gnostics understood the meanings of Deluge story to say that Ialdaboth sent the Flood against human race (particularly the “Unshakable Race” of the bloodline of Seth) because they “improved” and would not worship him like he wanted them to and had spiritual knowledge outside of his domain. However, there is no Gnostic “re-telling” of this story but there is a very interesting parallel in Plato’s Symposium, specifically in Aristophanes’s Speech on Love. Apparently, according to Aristopahanes, the human race was originally a Hermaphroditic species, meaning they contained by sexes in one body. In fact, he tells us there were three sexes! Now the sexes were three, and such as I have described them; because the sun, moon, and earth are three; and the man was originally the child of the sun, the woman of the earth, and the man-woman of the moon, which is made up of sun and earth, and they were all round and moved round and round because they resembled their parents. Terrible was their might and strength, and the thoughts of their hearts were great, and they made an attack upon the gods; of them is told the tale of Otys and Ephialtes who, as Homer says, attempted to scale heaven, and would have laid hands upon the gods. The gods, of course, did not take this threat lightly. Zeus concocted a plan to split this powerful hermaphroditic race into two, much like the idea of Jehovah scattering off and confusing the builders of Babel. Nimrod and Cush could even be seen as synonymous with Saturn as I discuss in Part 4 of the Forbidden Fruit series linked above. Zeus’ plan doesn’t go very well even when Apollo heals the other cut half. However, Zeus comes up with the idea of splitting off solar and lunar pairs into different bodies, which (mythological speaking) explains the longing of males and females to have breed and procreate with each other. Thus they were being destroyed, when Zeus in pity invented a new plan: he turned the parts of generation round to the front, for this had not been always their position, and they sowed the seed no longer as hitherto like grasshoppers in the ground, but in one another; and after the transposition the male generated in the female in order that by the mutual embraces of man and woman they might breed, and the race might continue; or if man came to man they might be satisfied, and rest, and go their ways to the business of life. So ancient is the desire of one another which is implanted in us, reuniting our original nature, seeking to make one of two, and to heal the state of man. In any case, the “Tower” archetype occurs in European aristocratic occultism, like in Enochian magic, which was devised by John Dee and Edward Kelly in the 16th century and eventually adopted and built on by S.L. MacGregor Mathers for the Hermetic Order of the Golden Dawn. We have the “Four Watchtowers” or what A Book of Supplications and Invocations written by John Dee which involves calling the Angels who preside over the Four Quarters of the Terrestial sphere. In other words, we are dealing here, with the Four Elements as developed further by the Golden Dawn. Apparently, these Watchtowers can be opened by invoking the correct Sacred names of God, which opens “gateways” to “heavenly” or “angelic cities” or dimensions. A more thorough and detailed explanation of all this can be found here. As I write this, I am astonished to find a really interesting parallel between Enochian Watchtower magic and some crazy vivid descriptions of the heavenly Pleroma in the The Untitled Text in the Bruce Codex as a “mother-city”. 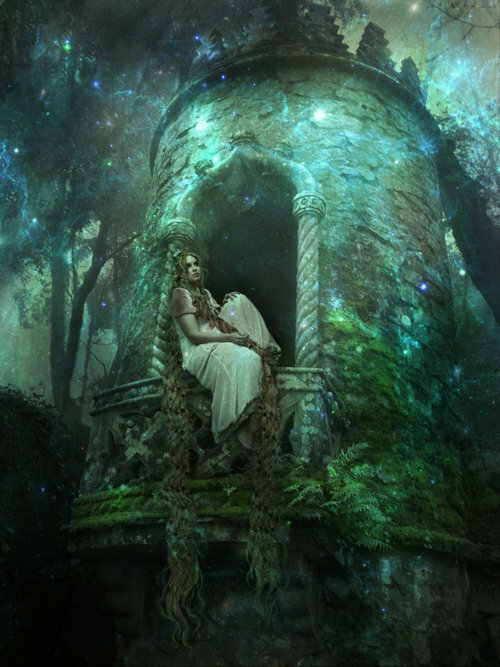 This divine tower is also associated with divine Wisdom. In Joseph and Aseneth, Chapter 2, it tells us that the tower of Asenath has its windows facing all directions but west—or to the Roman world. 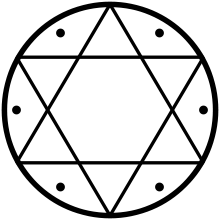 It has ten rooms with seven, perhaps representing the seven dimensions of the universe, populated by seven virgin servants who were all born on the same day as Asenath. The other three rooms are described as being a “storehouse” for her material, earthly pleasures and wealth. That she always looked out the east window would represent a rejection of the Roman world and/or a metaphor for looking toward the sun/Son. Near the house of the tower was an ever-bubbling spring flowing into a cistern which had a river flowing out of it that watered all the fruit trees around the house—an obvious metaphor for the Garden of Eden. On one occasion Aquila says he was present when Luna (Helen) was seen looking out of all the windows of a tower on all sides at once. 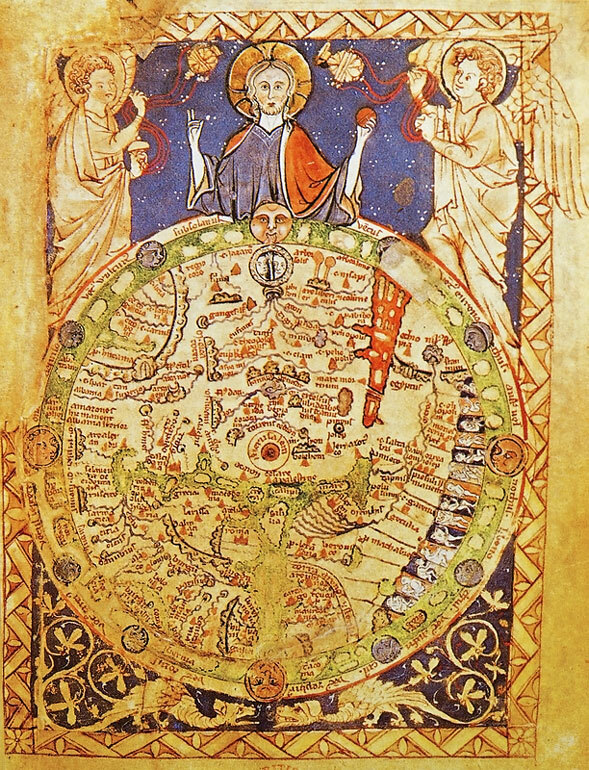 So here Helen, looks at “all sides at once” instead of just looking in the east. And finally in Epiphanius’ Panarion. Section 2, Pt. 21, 3:2, he writes that Homer described Helen of Troy “standing on a tower”. Truly, truly, I say to you, he who does not enter by the door into the fold of the sheep, but climbs up some other way, he is a thief and a robber. But he who enters by the door is a shepherd of the sheep. To him the doorkeeper opens, and the sheep hear his voice, and he calls his own sheep by name and leads them out. When he puts forth all his own, he goes ahead of them, and the sheep follow him because they know his voice. A stranger they simply will not follow, but will flee from him, because they do not know the voice of strangers. The Tarot card explanation also seems to support this idea as well. I’m sure there are other meanings assigned to the Tower symbol that I have unintentionally overlooked. I guess I am sounding like a Christian here by quoting Jesus Christ as I haven’t identified myself as such for a long time…but many stranger things have happened!